Yay for photos! All right, I know we've all seen EA Sports' renderings of the new Rbk EDGE uniforms, but it's time for some photos. 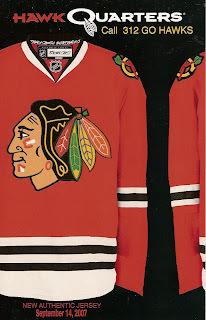 Chicago Blackhawks season ticket holders were treated to the new home sweater. It says the jerseys will be released tomorrow — the date we already have. Hopefully I'll be able to share more photos with you then.